FSM inaugurates a new concept in film score CDs: the "budget box set"—in this case, five western scores from the film library of United Artists presented on a 3CD set for $34.95. 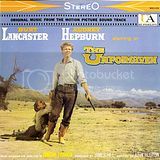 The Unforgiven (1960) starred Burt Lancaster as the eldest son of a Texas pioneer family who secretly adopted an Indian girl as their daughter (Audrey Hepburn). The film was directed by John Huston and explores powerful themes of racism in addition to being a big-budget action spectacle. The score by Dimitri Tiomkin features his Texas-sized sense of showmanship (with large-scale action cues for the frontier) as well as a lyrical, evocative love theme centered on Hepburn's character. The stereo LP (the only surviving music) is presented from the original master tapes. 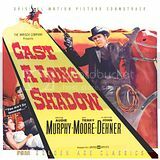 Cast a Long Shadow (1959) was a low-budget "B" western starring Audie Murphy as a fatherless drifter who inherits a ranch—and nearly destroys it in his effort to prove himself. The tuneful, Coplandesque score by Gerald Fried features an array of pleasing Americana themes and large-scale cues for the cattle roundups. It is presented in complete, chronological form in monaural sound. 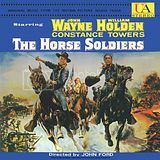 The Horse Soldiers (1959) is more accurately a Civil War film—the only one John Ford directed—starring John Wayne as a Union colonel who leads a horse cavalry on a sabotage raid deep into Confederate territory. William Holden costars as a humanitarian Union doctor. The score by David Buttolph makes liberal use of Civil War-era melodies, many of them performed vocally (in the style of the 1950s) as marching songs. The (electronic) stereo LP is presented here—the only surviving masters—which was more of a Civil War concept album containing a few Buttolph score cues. 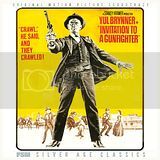 Invitation to a Gunfighter (1964) was a moody film starring Yul Brynner as an engimatic Cajun gunslinger hired by a small New Mexico Territory town to eliminate an ex-Rebel soldier. The film is not a High Noon-style suspense piece as much as a character story of prejudice and unrequited love. David Raksin's intricate, emotionally "interior" score features a terrific main title, and notably omits strings in favor of a chamber-like sound that emphasizes woodwinds. The complete score is presented in monaural sound from the finished film's music stem. 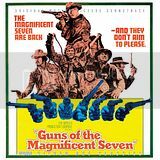 Finally, Guns of the Magnificent Seven (1969) was the second sequel—and third film overall—in the popular The Magnificent Seven series, starring George Kennedy, James Whitmore and Joe Don Baker amongst the titular gunfighters. Elmer Bernstein returned (along with his famous theme) in the score that was adapted for the new film by his orchestrators, Leo Shuken and Jack Hayes. Essentially, the score features versions of Bernstein's themes from the first two Magnificent Seven films arranged by Shuken and Hayes and then newly conducted by Bernstein in London. The previously unreleased complete score is presented in excellent stereo sound. If FSM released these three discs separately, the cost would be $59.85—or even $50.85 if the discs were $16.95 each. By bundling the material together as a "budget box," the cost is down to $34.95, and listeners get to enjoy some rare material that might never be released on its own. Extensive liner notes are by Lukas Kendall. The three discs and 32-page booklet are packaged in a "butterfly" or "clamshell" case (as with our 3CD sets of Mutiny on the Bounty and Goodbye, Mr. Chips), all attractively designed by Joe Sikoryak.